Lavish love onto someone special with this sumptuous collection of twelve luscious red roses. A red rose is the truest symbol of love, and with such intense colour, a delicate scent and a lavish appearance, it is easy to see why. For millennia, roses have signified an immortal love, appearing as far back as Greek and Roman mythology. 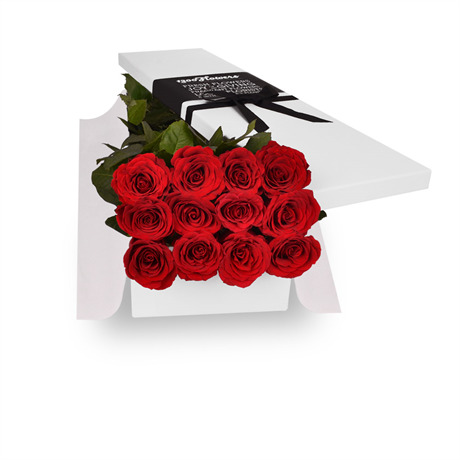 Carefully placed in a Hollywood box, these luxurious roses will inspire joy and happiness upon receival. The Sofia is perfect for a spontaneous romantic gesture or an anniversary. The Sofia works best with some sparkling champagne or delectable chocolates.